Going to a lakeside summer home maybe one of your favorite things to do when you were small. You remember those rustic pieces of wall decors, and wooden furniture around. Shades of browns, corals and other earth colors are splattered all over the place as you warm yourself by the fireplace. It feels and it looks cozy and warm, always welcoming anyone who comes in the door – that maybe the best description of your memories when you hear the word Southwest style. From Southwest lamps to wall decors and rugs, it’s something that evokes a certain feeling of hominess and warmth inside you. 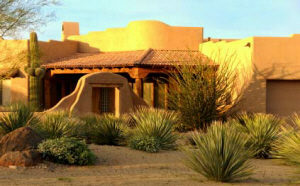 That is one of the reasons why most people want to incorporate Southwest style in their households. Not only does it give the home a homey feeling, but obviously, it also holds a charm of its own. From a mixture of Mexican, Euro-Spanish, and American Indian with a touch of Wild West, it is a very characteristic style that almost everybody can recognize. It mixes together the shades of browns, corals and blues, with touches of greens and reds from cactus and their flowers. Pieces of deities and other Native American pictures and decorations give it a distinct look, and stringed chili arrangements show a strong Mexican influence as well. Southwest lamps, both table and floor, wall sconces, and ceiling lights can also be added for a more rustic feeling. And who can forget Kokopelli, that trickster fertility deity? Southwestern style may have come from the southwest region of the US, but it isn’t confined there. A number of people have been decorating their homes with distinct Southwest pieces of furniture and other decors all over the country, which is probably why there are a lot of shops carrying Southwest style furniture and decorations. You can find them both in a store near you or in an online store like ours. For those people who want to achieve a Southwest look in your homes, here are some easy tips to get you started. Grab anything connected to nature – okay, maybe not exactly everything, but little potteries and pebbles with some plants can be a great addition inside your home. Cactus with flowers will also give you that rustic feel. If you don’t have wooden panels, then you can simply use brown or coral curtains. It will definitely help in creating a rustic ambiance around your home, as well as dim-lighting. Give your bed a makeover. Put on brown and orange bed sheets and a nice Southwest lamp by the bedside. These are just some simple tips to give your home that rustic feeling of being in a cozy log cabin. Of course, everything is still up to you. Learn to experiment and mix these elements together so you can achieve your dream rustic & cozy Southwestern style interiors. Depending where you live, you may not be able to enjoy the great Southwestern outdoors all year round. Even so, choosing the right table lamps can help you bring a taste of the Great Southwest Style inside your home. The desert look is definitely “in” when shopping for Southwest table or floor lamps. 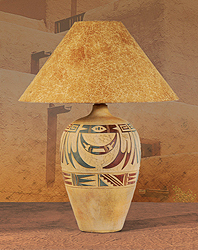 Consider designs featuring aspects of Southwestern culture, textures and colors, such as terracotta, browns, Petroglyph details, Native American designs including depictions of the traditional Kokopelli in Southwestern lamps. Don’t forget Southwest lamps with warm earthy tones of the Southwest or other natural materials. “S” Care Method To prevent overall soil, frequent vacuuming or light brushing to remove dust and grime is recommended. Spot clean using a mild water-free solvent or dry cleaning product. Clean only in a well ventilated room and avoid any product containing carbon tetra-chloride which is highly toxic. Pretest small area before proceeding. Cleaning by a professional furniture cleaning service only is recommended. “W” Care Method Use water base upholstery cleaner only. “WS” Care Method To prevent overall soil, frequent vacuuming or light brushing to remove dust and grime is recommended. Spot clean, with a mild solvent, an upholstery shampoo, or the foam from a mild detergent. When using a solvent or dry cleaning product, follow instructions carefully and clean only in a well ventilated room. Avoid any product which is highly toxic. With either method, pretest a small area before proceeding. Use a professional furniture cleaning service when an overall soiled condition has been reached. “XS” Care Method Clean this fabric only by vacuuming or light brushing to prevent accumulation of dust or grime. Water-based foam cleaners or solvent-based cleaning agents of any kind may cause excessive shrinking, staining or distortion of the surface pile and, therefore; should not be used. A word of caution on cleaning: never remove cushion covers or arm caps for separate cleaning. It may destroy the backing, cause shrinking and color changes. “SW” Care Method Spot clean with upholstery shampoo, foam from a mild detergent, or mild dry cleaning solvent. Pretest a small, inconspicuous area before proceeding. Do not saturate. Pile fabrics may require brushing with a non-metallic, stiff bristle brush to restore appearance. Hot water extraction or steam cleaning is not a recommended cleaning method. Cushion casings should not be removed and laundered or dry cleaned. To prevent overall soiling, frequent vacuuming or light brushing with a non-metallic, stiff bristle brush to remove dust and grime is recommended. When cleaning a spill, blot immediately to remove spilled material. Clean spots or stains from the outside to the middle of affected area to prevent circling. Use a professional overall soiled condition has been reached. It is not surprising for many people to choose the Santa Fe style southwestern architecture and interiors like décor and lighting into their modern lifestyle because of the warm ambiance they showered to their meticulously planned and stylish places of abode. These places are their shelter during times of peace and chaos so it is just proper that these homes deserve no other caring except the one with their own personal touch, from the table to the table runners and wall hangings. Depending on the home owner’s tastes, there are a lot of ways to lift up the moods of any home. If she is into replicating the original Santa Fe style interiors from the old western times, she can do a lot of easy and affordable things with smart combination of color and shapes depicting a true Southwest American culture. There are easy to find furnishings at home interior stores for pieces like southwest fabrics, pillows, ancient Santa Fe style, wall hangings, table runners and others along that line. Incorporating southwest themed upholstery fabrics into new and used furniture helps reinvent a fusion of two artistic approaches to home design. First is the collaboration of this ancient art being able to blend with the general architecture and functional design of the present home construction technology. Second is the economic beauty of being able to reborn an otherwise obsolete piece of furniture into a highly valued antique but usefully updated articles for the house. Some of the most popular southwestern fabrics chosen as great for upholstery are from a wide variety of chenille, jacquards and tapestries in great Southwest and Western themed designs. But do not confine your chosen southwest fabrics for upholstery because they also work wonders for beddings, table runners, pillow and draperies that add fervor to the flavor of your home décor. Commonly seen in Southwestern Arizona accessories are artifacts, ceramics, religious pieces, wall hangings, and colorful painted tiles. To produce the same effect using new materials, there are pillow cases which are made of fabrics with southwestern patterns echoing the Native American Indian Art and Santa Fe style. The original floors, Santa Fe style during the olden times were mostly out of packed mud. This style of architectural composition is reflected in the modern house construction with the use of hard flooring surfaces like tiles, bricks, and wood, with light carpeting. So, even if your home is miles away from the birthplace of southwest culture, you can still have yourself surrounded with great pieces of Santa Fe style or even Arizona characteristics using earth tone colors and neutral browns with clay red, turquoise, and green. It is best to match the Arizona-inspired draperies that you have chosen with side table lighting or floor lamps décor that are perfect for recreating an authentic southwestern atmosphere right at the comfort of your home. For some fixtures that are cast in iron, better pick some hand crafted décor from the exclusive range of New Mexican southwest iron furniture like bar and counter stools, dining, bistro, sofa and end tables, mirror frames and candle holders. In order for these metal furniture not to go out of sync with your other southwest pieces like your table runners, wall hangings and Southwest lighting, top each one with a cushion pillow in southwest fabrics to get that perfect Arizona-inspired theme that you want to maintain across your entire home interiors. Your home is your refuge, your escape from all the hustles and bustles of your life. It’s the place where you come back at the end of the day to relax and just laze around. As a reason, it isn’t quite unexpected that you just want to make your home more comfy, more welcoming and more appealing. With the right furniture and lights, you can have the right mood to relax at home. That is why Southwest lamps are becoming and more and more popular as an addition to houses nowadays. The Southwestern region is on the west of the Mississippi River and has varied ethnic origins, with prevalent Hispanic American & European American. New Mexico, Texas, Arizona and California are some of its included states. However, their art and their furniture pieces have a distinct appearance – antique-looking with flair of Mexican style. These Southwestern styles are rather rustic and they give you the feeling of being comfy. They include pieces of Native American art, hand-woven rugs, cowboy art and other leather rustic-looking pieces. There are a lot of Southwest lamps available in the market today. 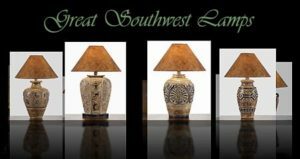 Southwest style floor lamps, table lamps, wall sconces or ceiling lights can be found not only in the Southwest, but all throughout the country, both in stores and through online stores. These pieces will definitely perk up your interiors, like that feeling of walking into a log cabin in the middle of the woods. Here are some tips on how you can achieve a Southwestern feel and look at home. If you do not have wood panels at home, you can try to put curtains in the shades of brown, corals and other earth colors. This will give off a rustic ambiance at home without having to modify your walls. Lay the lights low. Setting the lights dimmed will provide a more comfy ambience, enough to lull you to sleep as you look at those leather and rustic details around your home. Don’t be afraid to experiment. If you have a lot of pieces and furniture, don’t be scared to mix and match them. Put that chair there and that quilt here. You’ll never know unless you try it. Put cactus and other southwestern plants. Together with some cactus flowers, greens, reds and pinks will blend with your home. Put up rugs and potteries. Those brightly colored rugs with Mexican or Native American patters will provide a great contrast with the earth colors around you. Surely, you can incorporate Southwest lamps in any room in your home. A nice table lamp on your bedside would be the perfect accent, likewise a floor lamp in your living room beside that cactus plant. Throw some quilts on your leather sofa, and put up rustic wall decors with nature’s flair. Even some pottery pieces in your bathroom, with soft wall sconces can make it more like a bathroom from a summer home. Experiment, mix and match. Always know what you like, and let Southwest lamps light your way to a beautiful and comfortable home. Yesterday we made a drastic change in our website. To better serve our customers and visitors we migrated our online store to more modern and more accessible platform. If you are looking for something we had and you can’t find it just drop us an email and we’ll get back with information.